Order your copy directly at Springer or Amazon. Online version now also available via SpringerLink. This book is supported by the Next Generation Infrastructures Foundation. Modern societies heavily depend on infrastructure systems such as road-traffic networks, water networks, and electricity networks. Nowadays infrastructure systems are large-scale, complex networked, socio-technical systems, that almost everybody uses on a daily basis, and that have enabled us to live closely together in large cities. Infrastructure systems are so vital that their incapacity or destruction would have a fatal effect on the functioning of our society. The complexity of these systems is defined by their multi-agent and multi-actor character, their multi-level structure, their multi-objective optimization challenges, and by the adaptivity of their agents and actors to changes in their environment. The operation and control of existing infrastructures are fallible: too often people are confronted with capacity problems, dangerous situations, unreliability, and inefficiency. More intelligent infrastructures gain an advantage in terms of more efficient capacity management, improved reliability of service, increased sustainability, and enhanced infrastructure security. Infrastructure operation should be able to more autonomously determine how to operate the infrastructure, taking into account the most up-to-date state of the infrastructure, and taking into account the existence of several decision makers, such that ultimately the infrastructure is operated in a pro-active way and issues are resolved quickly. 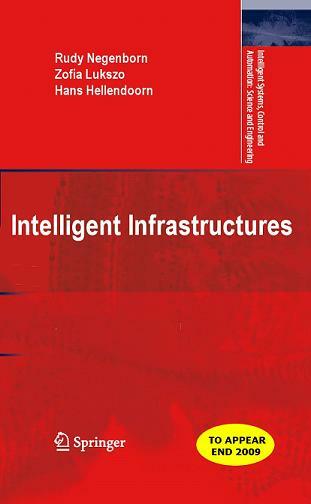 This book concentrates on a wide range of problems in the way infrastructures are functioning today and discusses novel advanced, and intelligent methods and tools for the operation and control of existing and future infrastructures. How to more efficiently use available transport capacity? How to improve the reliability of service? How to make infrastructures more environmentally sustainable? How to enhance infrastructure security? This book considers the way in which infrastructures are functioning today, how they will evolve into infrastructures of the future, and how novel and advanced methods and tools can be used to improve the performance of these next generation infrastructures. ... for the invited authors.